I am a therapist who would like to be put out of a job because people become so well-equipped at caring for themselves and each other that I am not needed. I am a therapist who questions the mental illness paradigm and deeply wishes for people to see their mental suffering outside of a box of pathologies and disconnected individual treatment. I am a therapist who wants to share as many of the tools that I have as possible with communities of color so that we feel empowered to meet each other’s suffering with presence and love. In the aftermath of violence (relentless violence) mental health professionals are often called upon to act as emergency responders. And the truth is that even if there were enough of us to respond to the countless acts of violence that happen every day, in the immediate aftermath of trauma there is not much to do outside of being with each other and holding each other’s very real pain. I do not mean that people might not need professional help for things like posttraumatic stress disorder. What I mean is that I believe that ordinary, non-certified people have the power and ability to be with each other through the immediate aftermath of overwhelming and devastating events in a way that meets each other’s needs. I am having a hard time taking in the continued onslaught of violence against Black people and violence against queer and trans people of color because the scale of it is overwhelming to my senses. After years of doing trauma work, my immediate response to mass devastation is often numbness, silence, stillness, and in my person life, avoidance (very common trauma responses). And while these are all psychological protective defenses to avoid pain, I know that the only way to truly deal with pain is to let it in and witness its truth. The load that Black people and QTPoC are carrying is way too heavy to bear alone. We took care of each for thousands of years through tragedy and loss before therapy was invented. What I want to offer today are some simple steps we can take to be with each other through pain. Because I know that so many of us have a hard time being in large groups after devastating and overwhelming acts of violence, I am offering a simple approach to being together in pairs. 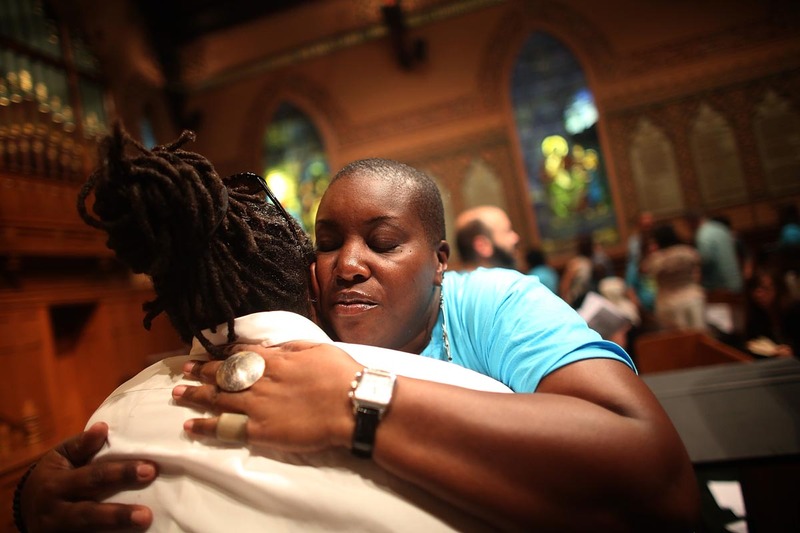 Most often after overwhelming trauma, we need to be with each other, be seen, and be heard. Much of grieving is a process of being, not doing. Step 1: Make an agreement to spend sacred time with a friend or partner (even if you don’t know them that well – this could be an opportunity to connect). Step 2: Arrange the physical space in a way that feels supportive and honors who you are and perhaps honors your ancestors as well. This might include creating an altar or attending to one that you already have. You might light candles, paint a picture, light incense, put down fabric or lay out special stones. Make a ritual of laying out material items that feel sacred or simply speak to you right now. Do this with minimal talking with the person/people you chose to do this with. Step 3: Take a moment to sit and face each other, or sit side-by-side facing in opposite directions with your right arms touching. Or, if neither of these positions feels right, choose another way to sit that feels right, but try to have some contact whether it be physical or visual. Connection is key after traumatic events that send the message that you do not belong. Step 4: Breathe into your belly for 10 breaths. You may close your eyes or keep them open. Your choice. If you keep your eyes open, pick one spot to rest your gaze rather than look all around the room. Inhale through the nostrils and exhale through the nostrils or the mouth. Breathe slowly. Count your inhales. Count your exhales and exhale for at least one more count than your inhale (the exhale is the more grounding breath and thus should be longer to produce more grounding energy). After a few breaths, try to sync your breathing with your partner’s breathing (this further cultivates connection). Step 5: In silence, notice 3 colors in the room. Then notice 3 sounds. Feel the chair or ground underneath you. (This anchors you in the present moment. Do anything else that brings your attention to the present moment). Step 6: Now begins the talking part or whatever else may come up (tears, singing, sounds, anything vocal). Pick a person to start speaking first. Allow this person to express whatever is present for them right now. There is no directive for this. It is open stream of conscious expression. The only thing to avoid is very detailed descriptions of violence or abuse (i.e. then the person did this and I felt that, and then they x, y, and z). Of course you can talk about the violence and abuse, but avoid recounting the specifics in a narrative fashion as if you are re-living an event out loud. This can be re-traumatizing and often leads to a sense of being revved up rather than relieved. Besides this, share anything that comes up, even if it doesn’t feel like it makes sense. There is no way to do this wrong. While the first person talks, the other person listens without interrupting. I suggest timing the initial sharing (i.e. select 3 minutes or 5 minutes), but if this does not feel right, you do not have to. If the person talking finishes talking before the timer goes off, simply sit in silence and wait for the alarm to sound and close the first sharing. If you use a timer, choose a calming chime to signal the end of the time. Once the first person has shared, both people take 3 deep breaths. Then, the listener reflects back some of what they heard the person share. I.e. “You feel angry, and devastated and weak and just want to curl up. You also want to go home and be with your family.” The listener does not have to reflect back everything they heard, nor do they have to repeat the exact words of the speaker. The listener reflects back what they are able. You may also time this. If you time this, make this time a littler shorter than the time of the person who spoke first. The listener does not have to get it perfectly. The aim is to be able to reflect back some of what has been said so the speaker feels heard and seen and so that the listener is focused on the person talking rather than focusing on their own internal reaction. When complete, take another round of 5 deep breaths. The listener and the speaking person then switch. The speaking person’s goal is not to respond to what the first speaker said (though there might be some thoughts inspired by the first speaker), but to express whatever is on their heart and mind in this moment. The same process of speaking without interrupting and then listening with reflection is repeated (with the same time if used). When the 2nd sharing and reflecting is complete, take another 5 deep breaths. Turn to look at one another if you are not already facing each other. Look at each other, into each other’s eyes, for at least one minute in silence. You may giggle, or feel awkward. That is ok. Keep looking. Bear witness. Be with. Notice what is happening inside your body, emotions and mind. You may then begin to speak in a normal conversation, opening with the question, “What do you need right now?” This does not have to be something you need from each other, but simply begin to articulate any needs that are present. Be with each other in conversation, or in silence, until you both feel complete. Respect boundaries for needing to end at a certain time and be ok with whatever arose, even if it was not what you expected. You are not responsible for the other person’s pain. You should not be trying to solve problems or fix anything. You are simply being with each other and bearing witness to each other’s pain. This must be clear and agreed upon at the start. A lot of us are in caretaker roles in our relationships, and this is not an exercise to perpetuate this dynamic. This is an exercise of balance and equal partnership. Pause and breathe if you feel overwhelmed. Remember that although Black people and QTPoC are not safe in this society, in this very moment you are ok, in this place, with the person you chose to be with. If you are a person who needs boundaries to feel calmer, decide on a time frame for all of this, so it does not begin to feel exhausting or go on too long. I often find that much can be gained from doing all of this in a short amount of time (like, a 50 minute therapy session, for example J). There is no one right way to experience pain. If you feel nothing, it’s ok. If you feel everything, it’s ok. There is no one right way to grieve. There is, however, a less difficult way to grieve, and that is to meet whatever is present for you and your loved ones with compassion and radical acceptance. CarmenLeah Ascencio is a public health social worker, community theatre facilitator, trauma-sensitive yoga instructor, educator and proud Boricua 2nd generation queer femme. She is the director of Get Free and the creator of Freedom Labor Love. 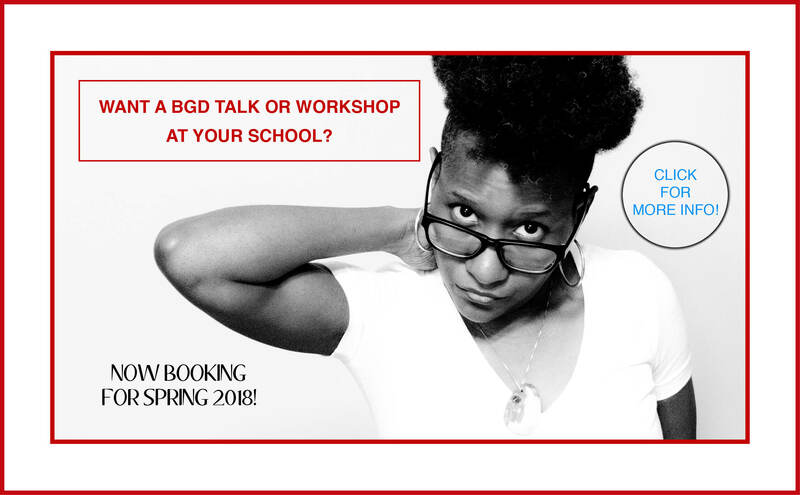 She speaks and facilitates BGD Get Free workshops at organizations and schools. To find out about booking CarmenLeah, go here.